Cataract extraction is the process of removing the lens of the eye and replacing it with an artificial one. It is eye surgery and often the lens is cloudy making it hard for the person to see. It is a common and safe procedure performed regularly on older people. The procedure is performed on an outpatient basis by an ophthalmologist often on a outpatient basis. This procedure treats cataracts because they cause blurry vision and cause light glare to be more intense. Often it is hard to do normal activities that require good eyesight like driving, working, reading, and watching television. There are some risks to cataract extraction or surgery but most can be treated. 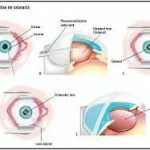 Sometimes infections, bleeding, swelling, and loss of vision occur after surgery. Often the doctor will give the patients an ultrasound test to measure the size and shape of the eye. That way they can determine the right lens to implant. They may also give eyedrops to reduce infections. The surgery itself often takes less than an hour to do. Eyedrops will be put in the eyes to dilate the pupils. They provide a local anesthesia to numb the area. During surgery this cloudless lens is removed and an artificial one implanted. Some doctors use an ultrasound probe to break the lens. They make a tiny incision in the eye and insert a thin needle probe into the lens where the cataract is located. Ultrasound waves break up the cataract and they suction the fragments. The back of lens is left. Sometimes a larger incision is made and this often requires stitches. 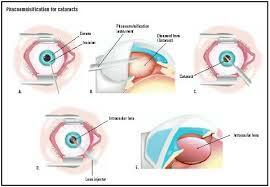 The lens implanted becomes part of the eye.